This exhibition entitled Trust by Northwest artist Kim Osgood includes a new series of refreshingly colorful monotypes. Her delightfully lively one of a kind prints spill over with playful and appealing elements portraying familiar imagery of birds, flora and fauna, and domestic elements. The work’s irresistible vivacity affected by her personal energy and enthusiasm is apparent in its celebration and elevation of the common object. Osgood’s personality is well suited to the spontaneous technique of monotype, laying out a composition intuitively with oil-based printing inks on plexiglass, she uses an offset press to “pull” a unique work on paper. Particularly compelling in this body of work is an exploration of composition, through shape, asymmetry, reflection, and negative space. Her developed spatial depth, heightened by her frequent windowed background elements, is further accentuated by subtle renderings of reflections in the foreground. In this show her distinct vocabulary of transcendent imagery and vibrant color is enhanced by a poetic less is more sensibility. 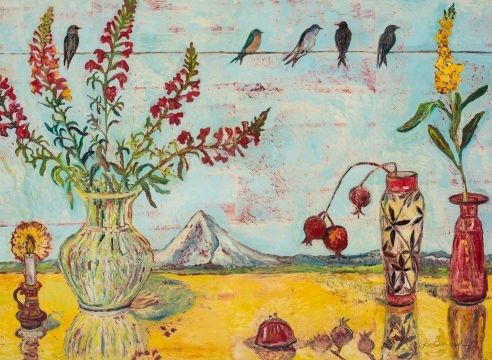 Kim Osgood has exhibited her work since the mid-1980s and includes the Oregon Biennial, Portland Art Museum; PICA; PVCA; Washington State University, Pullman; and Coos Art Museum, Coos Bay, OR. She studied at Skidmore College in Saratoga Springs, NY and the Rhode Island School of Design. Her work is well collected and is part of many collections including the Bill and Melinda Gates Foundation, Seattle, WA; Nordstrom Inc, in multiple states; Legacy Emanuel Hospital, Portland, OR; Meyer Memorial Trust, Portland, OR; MOMO International, New York; Oregon History Center, Portland; and The Vivian and Gordon Gilkey Center for Graphic Arts, Portland Art Museum, OR. Kim and her husband own Paloma Clothing in Hillsdale in Portland.